After a lifetime of relying on words to communicate, I discovered the language of visual art which allows more articulate and subtle expression than I could ever achieve with mere words. I hand dye fabric and sew it into quilted wall hangings as my medium of visual expression. I consider my work “painting with cloth,” but with an extra tactile element. My quilts are primarily abstract explorations of form and colour and the emotions evoked by these elements, but I also hope to elicit a physical response in the viewer whose hand almost invariably seeks to touch the wondrously sensuous surface of the quilted cloth. Cher has shown in a number of regional, national and international exhibits, including being juried into Quilt National two times. 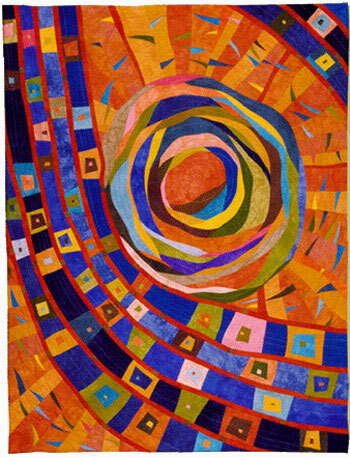 Ten pages of her work was included in Lark Books' publication, Masters: Art Quilts.